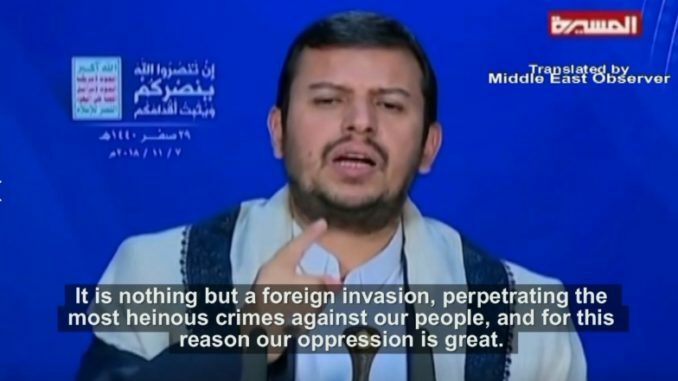 Leader of the Ansarullah Houthi movement, Sayyed Abdul Malik al-Houthi, explains why he views the years-long Saudi-led military campaign in Yemen as being based on unjust and illegitimate grounds. Houthi also accuses Riyadh of carrying out a genocide campaign against the Yemeni people, while using superficial and baseless reasons to justify its actions. Our people refuse to be a merely submissive, crushed, subservient and defeated people, under the control of the Emiratis or the Saudis, who themselves – the Saudi and Emirati regimes – are nothing but completely submissive tools for US hegemony and the American administration, and (regimes) who are in open alliance with Israel, moving in the orbit of American (hegemony), playing a destructive role in the Ummah, and against the peoples and interests of this Ummah. Today, we as a Muslim, Yemeni people, need to refer to our great oppression, a great oppression that we the Yemeni people suffer from, a great catastrophe caused by this aggression. This aggression has (legalised) the shedding of our blood, and sheds it on a daily basis, without any restraint, consideration, or regard for anything, neither human rights, nor (religious) law, customs, laws, or anything else. It perpetrates genocide against all the people of this country, against children, and there now are huge crimes that have been documented and are well known to all, and they have admitted to having mass-targeted children, like the Dahyan school bus (incident), like the targeting of many schools, like the killing of great numbers of children with their families, parents, while they are in their homes which are destroyed, sometimes while they sleep at night, in the (targeting) of the various social events and gatherings of this people, during its happy (occasions) and sad ones, (the targeting) of weddings and funerals, in the targeting of marketplaces and mosques, and (the targeting) of social gatherings of all types. Huge crimes, in an unjustifiable and unjust war. The assault on an independent country, they have no right to attack it, they have no religious or legal justifications whatsoever for this aggression, no matter how much noise and claims they make in their media, and no matter how many times they repeat certain terms, which have no meaning in reality, nor do they apply to what they are doing. There is no ‘legitimacy’, neither for this aggression, nor for its collaborators. No one, no much which country he comes from, has the legitimacy to call upon another country to occupy his own land and country, and to kill his own people. This is a nonsensical notion. Anywhere in the world, were an individual to come forth, or even the president of a particular country, a real president (i.e. whose term has not ended, and who has not submitted his resignation) and says to a certain country or government: ‘I want you to occupy my country, and to kill my people’, does this become justified and legitimate? No, no one in the world has the right to do this, let alone a government. Abed Rabbu (Mansour Hadi’s presidential) term, which had a limited timeframe known to all, in fact ended. Despite this, he then submitted his resignation, and he was adamant about that. And he admitted that he was surprised by this aggression, and that he had no knowledge of it until after it begun, and this has been video documented, and was broadcasted by the media. Likewise the then government, that of (Khaled) Bahhah, had submitted its resignation, thereby ending its (term), and it insisted on carrying out that resignation. Hence, there is no legitimacy, neither for Abed Rabbu, nor for that government which had in fact resigned, nor does anyone in this world have the right – whether that person is a president, prime minister, citizen, or any other individual – to call upon any other side in this world to occupy his country and kill his own people. Then that other side comes and occupies, destroys, kills, and perpetrates crimes, under what pretext? They say: ‘I am supporting (the reinstalment) of the legitimate (power)’. This is baseless, nonsensical talk. All sane, healthy people, and who have the slightest knowledge about these developments on the ground, in relation to the Saudi and Emirati aggression on our country, (all people know that) both of them did not come out of love and care for any Yemeni side, neither for Abed Rabbu, is Abed Rabbu someone they are madly in love with, that they crush the Yemeni people for his sake, and that they incur huge economic and military costs for his sake? What is the story? Or is it for the sake of Ali Mohsen (al-Ahmar) or the Al-Islah party or the Transitional (Council), or for the sake of this or that side? Every one of us knows, and reality bears witness, and the issue is clear, that the Saudis and Emiratis do not view Abed Rabbu, the (Southern) Transitional (Council), the Al-Islah (party), or any side or individual in this country that fights alongside/supports them in their war against their (own) country, as nothing but tools. They use them (as tools), exploiting them in the aggression against this country. The (Saudis and Emiratis) buy out groups of (Yemenis), to exploit them by placing them on the frontlines in the war against this country, so that they can avoid (suffering) huge human losses (from their own ranks). For example, in the beginning (of the war) the Saudis were suffering huge loses amongst the ranks of its soldiers and officers along the border, thereafter, they considered themselves as having bought some Yemenis, just as if they bought them from a slave market, as if they had bought them as slaves for a specific purpose. What purpose? So that they can be at the behest of its soldiers and officers. So that (the Saudis) could send them onto the frontlines, while leaving their soldiers and officers at the rear, so that the casualties and losses are from those cheap, treacherous Yemenis who betrayed their people and nation, and decided to fight in the ranks of the Saudis. The Emiratis are doing the same, putting forth those whom they acquired through money before their soldiers, as they move under the Emirati flag, under the command of Emirati officers. Those same Emirati officers, fall under the command of American, British, and Israeli officers situated in operations rooms. This is how the situation is. It is nothing but a foreign invasion, perpetrating the most heinous crimes against our people, and for this reason our oppression is great. In reference to this oppression, and in reference to what is just, and we are on the just side, we are the owners of this land, we are its people, who have been residing in it for generations. It is they who are the invaders. They are the ones who came as invaders to our lands. Otherwise then, are we from a different planet, while they were residing in the country? No, this is our country, as the people of Yemen. We are the rightful ones, and we were unjustly attacked first. Hence, they are the attackers, and we are the ones being attacked. They are the oppressors, and we are the oppressed. They are the ones who have no right to do what they are doing, while we have the right to defend ourselves, and our land, people, women, dignity, freedom and independence.